Born in 1648, Thomas Thynne was the eldest son of Sir Thomas Thynne and his wife, Stuarta. On the death of his childless uncle, Sir James Thynne, in 1670, he inherited Longleat House and the family's estates, and his nickname derived from the fact he was believed to have an income of £10,000 p a. Richer than most peers, Thomas spent most of his money on his own pleasure. He dressed as if he were the epitome of the Restoration rake, sporting "a gray wide-brimmed hat, silk shirts and stockings...a lace embroidered waistcoat, black velvet breeches and a green frock coat," all topped off with a gold-fringed scarf seven yards long. Having gone to Oxford, he joined the entourage of James Stuart, Duke of York, but later some quarrel arose between them, and Tom switched allegiance to the rival camp of James Scott, Duke of Monmouth. Thomas spent most of his time at his London house in Cannon Row, leaving his Wiltshire estates in the hands of agents, and himself free to tour London's brothels and gaming houses in the company of the Duke of Monmouth. When Monmouth made a tour of the west country in 1680 his arrival at Longleat was greeted by flowers strewn in his path. As a member of the Green Ribbon Club, Thomas took a leading role in the Exclusion Crisis of 1679-1681. On 30th June 1680, he was one of ten lords and ten commoners who proposed that the Duke of York should be brought before the grand jury of Middlesex as a papist. As a result, Charles II deprived Thomas of his command of the Wiltshire militia in November 1681. Thomas married Elizabeth Percy, the only child of the deceased Joceline Percy, 11th Earl of Northumberland. Despite being only fifteen, Elizabeth was already an extremely rich widow, having married Henry Cavendish, Earl of Ogle, at the age of thirteen. The earl died within the year, and since Elizabeth had remained with her grandmother at Petworth throughout that time, it was almost certain that the marriage was never consummated. The dowager Countess of Northumberland, Elizabeth Howard, was equally keen for her grand-daughter to marry the wealthy owner of Longleat. To obtain her acquiescence to the match, Thomas promised Elizabeth an allowance of £2,000 a year, and during the course of the wedding ceremony in July 1681, with the pronouncement of the words "with all my worldly goods I thee endow," he produced a bag holding one hundred gold guineas and held them out to his intended, who promptly wrapped it in her handkerchief and stuffed it down the front of her dress. Having escaped her grandmother's clutches, Elizabeth was reluctant to shut herself away in Longleat House, so she went to the Netherlands for a year with Lady Dorothy Temple, the wife of William Temple. Thomas happily spent the intervening time gaining control of his wife's property despite the protests of many of her relations, whilst awaiting her return. In the Hague, Elizabeth met John Philip Köningsmark, a Swedish Count, adventurer and serial seducer of impressionable women. Having succeeded in making Elizabeth his latest conquest, Köningsmark twice issued Thomas Thynne a challenge to fight a duel through his steward, Captain Christopher Vratz. Thomas declined, but it is said to have sent his own party of six men to France to murder Köningsmark, or at least forcibly dissuade him from further contact with his wife. Undaunted by their failure, in February 1682 both Köningsmark and Vratz arrived in England, and together with the count's groom, a Pole named George Boroski, and Swedish mercenary John Stern, they met at a tavern in Whitehall. Whilst Thomas's carriage travelled down the Pall Mall, where he had gone to pay a call on the dowager Countess of Northumberland. Vratz seized the horses and forced the carriage to stop, while Boroski fired his blunderbuss at Thomas Thynne. Stern was too drunk to take any direct part in the murder, but fled the scene. Wounded in four places, Thomas and rushed to his house in Cannon Row and died in his bed at six the following morning, surrounded by the Duke of Monmouth and his friends. Magistrate John Reresby conducted the investigation, and on the 13th February, Vratz was arrested in his lodgings and gave up the whereabouts of the other two. All three were apprehended and taken before the king. Vratz admitted that he had been employed by Köningsmark, but claimed that the intention was only to force Thomas to fight a duel and that Boroski had misinterpreted his instructions. Boroski in turn swore that Vratz had ordered him to kill Thynne, whilst Stern pleaded that he had no knowledge of either the planned duel or the murder and had simply the misfortune to be in the company of Vratz when the deed was done. Nevertheless all three were placed in Newgate prison. Charles II was relived to discover the arrest of three foreigners meant that the crime was of no political significance, and was unlikely to stir up anti-Catholic sentiment. Count Köningsmark was apprehended a week later at Gravesend by the Duke of Monmouth's steward, where he had been trying to obtain passage home to Sweden. He was briefly examined before the king and council and again by the Lord Chief Justice Francis Pemberton, before being committed to Newgate. Vratz, Stern and Boroski were charged with murder, while Köningsmark was charged as an accessory before the fact. His cohorts were all found guilty, but Köningsmark was acquitted. The judge, the Lord Chief Justice Francis Pemberton, condemned the three conspirators as "not fit to look upon themselves as accounted men," favoured Köningsmark during the trial at the Old Bailey, and directed the jury to acquit him. Reresby claims he had been offered (and declined) a bribe to favour the Swede and John Evelyn said that Köningsmark "was acquitted by a corrupt jury". Vratz, Stern and Boroski were sentenced to be hanged at Pall Mall on the 10th March 1682, the scene of the murder. Vratz faced his fate with stoicism and asked to be excused the customary blindfold; "Never man went so unconcerned for his fate," wrote John Evelyn. Boroski shook with fear, whilst Stern verged on hysteria. As the man who had pulled the trigger, Boroski's corpse was hung in chains at the Mile End Road as the customary warning, Stern's remains were quietly buried, whilst Vratz's corpse was embalmed and returned to Germany in a lead-lined coffin "too magnificent for so daring and horrid a murderer," according to Evelyn. Köningsmark was killed in 1687 at the Siege of Argos fighting the Turks. The twice-widowed Elizabeth Percy married Charles Seymour, 6th Duke of Somerset, known as "The Proud Duke" who was rumoured never to have addressed his wife by her given name. 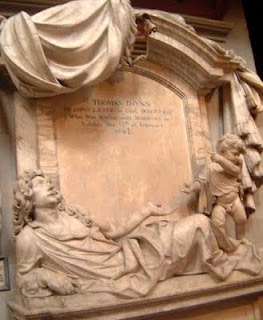 Thomas Thynne's remains were interred at Westminster Abbey in a marble tomb. Beneath his recumbent figure flanked by a prancing cherub, a bas-relief panel depicts a representation of the scene of his murder at Pall Mall. Or laid with the woman he married.